Another week, another new Kernel IPA. This one features two hops that I very much enjoy: Amarillo and Mosaic. 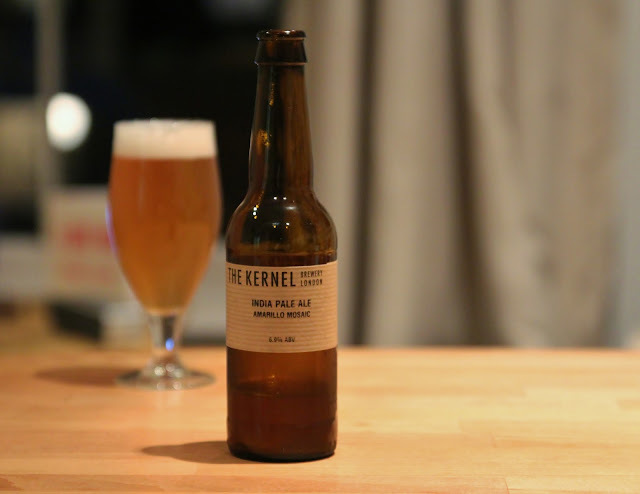 Indeed, Kernel's single-hopped Amarillo and Mosaic IPAs are some of my favourite beers the brewery has ever produced. While I don't think this combination quite matches up to the level of the single-hopped versions, it's still outstanding, and more expressive than the vast majority of IPAs out there. This one pours hazy orange-gold with a frothy white capping. The aroma features a lot of plump and juicy citrus, particularly orange and tangerine, along with melon, pear and a little dank pine. Light to medium sweet flavour with a nice pale, bready base, some ripe cantaloupe, more tangerine and orange, restrained piney bitterness. Medium bodied with average carbonation. It's lightly resinous on the finish, somewhat warming, with gooey citrus fruits, more orange, nectarine, tangerine, pine, further pale bread and melon. Overall, it is a classic Kernel IPA: juicy and vibrant, and the liquid vanishes all too quickly.